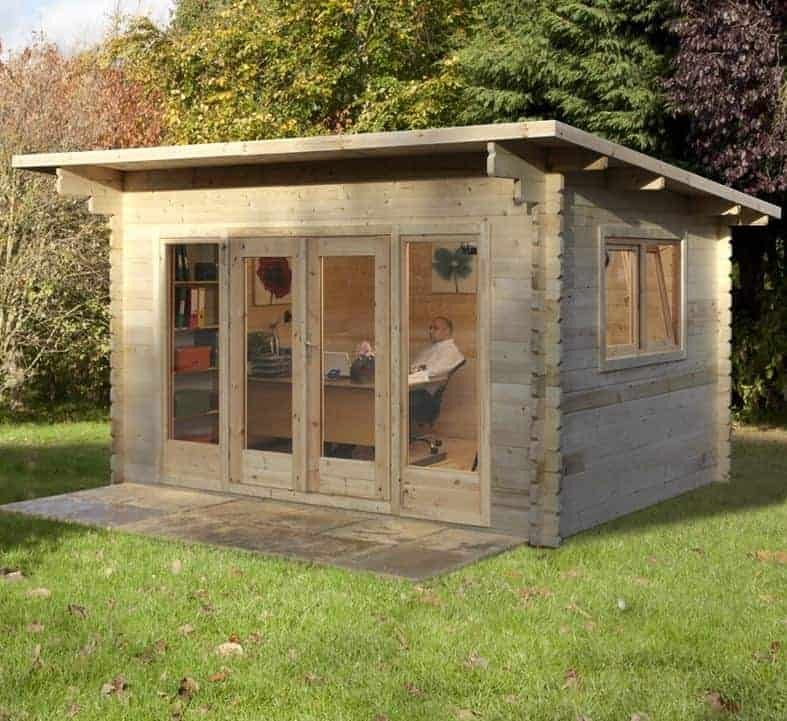 This pent roofed log cabin can make a valuable addition to any property, as not only will it look great in the garden thanks to its glazed front with Norwegian Spruce timber, it also creates a highly flexible new room. It’s generously proportioned so that it could easily be used as a dining and entertainment room for people who often have guests visiting, or alternatively it could be used as a study or office for the growing numbers of people who work from home. Whatever purpose it’s used for, it’s likely to contain valuable furniture or equipment. That’s why security is all important, especially today when cabin and shed crime is perceived to be on the rise. We were glad, therefore, to see that a strong and secure key operated lock is included as standard, and this should bring reassurance and peace of mind. This is a real heavy duty log cabin with both the walls and the tongue and groove floor being substantially thicker than we often see. It means that the building has excellent weather proof qualities, and we were also glad to see that the large side window, to complement those at the front, can be fully opened to allow fresh air in when required. We review a lot of log cabins, most of them featuring a variation on an apex roof. That’s why it was a pleasant surprise to see the pent roof featured here. It gives the cabin a unique and yet very attractive look, especially as it also boasts a glass dominated frontage. 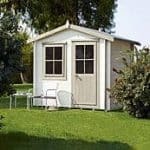 Whether you use this as a home office or as a place to entertain and impress guests, this is sure to become a much talked about feature of your property. The pitch of the pent roof, which is made of strong tongue and groove cladding covered in felt, makes it effective at carrying rainwater away without being too obtrusive. Nevertheless it’s taller than you might think at first glance, with a peak height of 2.54m and an eaves height of 2.24m. 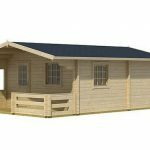 The overall width of the log cabin is 4.00m and the overall depth is 3.00m, so it provides 12 square metres of versatile space. The feature that we liked most of all about this log cabin was its unusually thick cladding. Made from Norwegian Spruce that’s been smooth planed to give it extra strength, it has a thickness of 44mm which is almost twice as thick as some of the cladding we see on similarly sized buildings. It locks together tightly, so is effective at stopping rainwater from reaching the interior, and creates a very strong and stable log cabin once assembly is complete. We were very impressed by the floor as well. Once more, it’s thicker and stronger than most that we review, being made from 28mm tongue and groove. This removes the need to strengthen the floor, even if heavy objects such as a sofa or bed or going to be positioned upon it. Whilst this log cabin exceeded our expectations in many areas, this wasn’t the case when it came to looking at the treatment requirements and warranty. No initial preservative treatment has been used by the manufacturer, which potentially leaves the timbers vulnerable to rot. It’s essential therefore that the customer buys high quality wood preserver and applies it as soon as possible after installation. We also recommend that it’s then treated on a yearly basis. Even if this treatment schedule is kept up, and rot is therefore kept away, there is no extended warranty provided by the manufacturer. 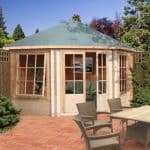 With a garden building of this price, we feel that more than a basic one year guarantee should have been provided. The fully glazed doors make a striking entrance to the log cabin, and what we especially liked about them is that they’re 1.54m wide and 1.85m tall. Both these dimensions are more generous than we usually find, and as they’re also centrally positioned it’s incredibly easy to move tall or wide objects inside. Whilst the doors feature large glass panels, they are flanked by two more windows that run from the floor upwards and provide even more light. Even more importantly, in our opinion, is that there’s another window on the side, and this one can be opened using a tilt and turn mechanism. That makes it an ideal source of ventilation, and means that the interior is both airy and light. It’s a pleasant space to pass the hours in, whether for work or leisure. 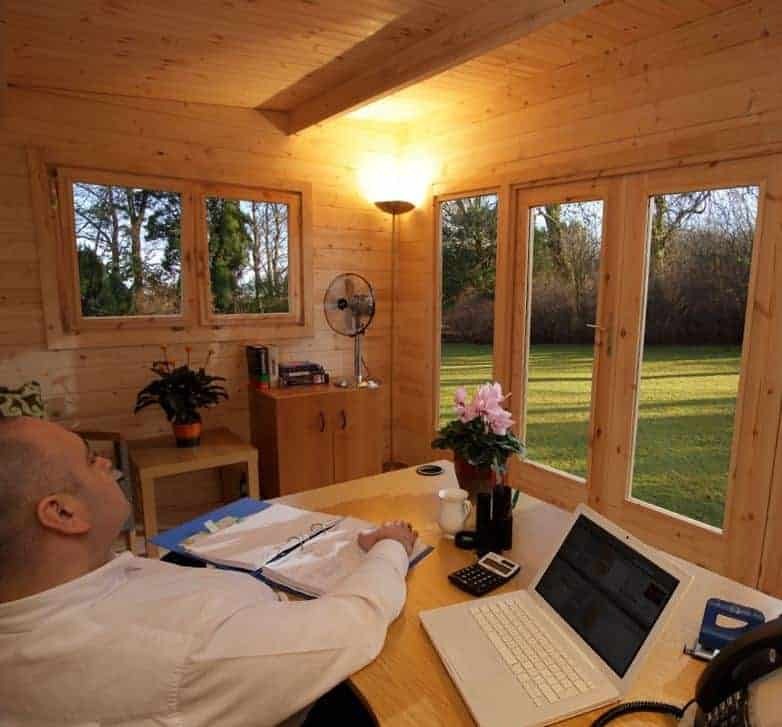 We were pleased to see that double glazing had been used throughout, as this gives the glass extra toughness and therefore provides extra security for the log cabin as a whole. The security feature we particularly welcomed however was the inclusion of a key operated lock. It’s the best locking system that a log cabin can have, although we still feel that it can help to add an alarm system as a visual deterrent as much as anything else. There is only one optional extra available to buy with the log cabin, but it’s one that we feel many people will find useful. It’s a professional assembly service, which means that people who are less than confident about their DIY skills or who have very busy lifestyles can still be assured of a quick and perfect installation. 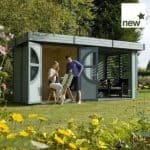 At a cost of £599 however it does add significantly to the initial outlay, and the cabin isn’t as difficult to assemble as you might imagine. The above average thickness of both the wall cladding and the tongue and groove floor is an indicator of this cabin’s high quality components. If the timber had been pressure treated then this would have been a durable building, but without such treatment it loses marks. 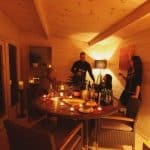 Even though this is a mid sized log cabin, it’s still possible to fit a lot of furniture or electrical equipment inside. As you’d expect with a large timber building there’s a lot of components to assemble, but with a friend’s help it can still be installed in less than a day. Final Thoughts: We always like pent roofs on large garden buildings as it creates a more uniform space inside. 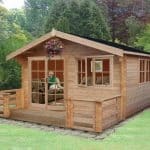 That’s certainly what we found in this attractive yet unobtrusive log cabin that should fit in nicely with any traditional garden environment. The other thing that caught our attention at first sight was just how much glass there is, which makes this an ideal environment to work from. It was good to see that double glazing was used as this allays any security concerns that having so much glazing can bring, and we were also glad to see a key operated lock provided on the large double doors.